Last month, I wrote about some important legislation in Florida that would modernize that state’s harsh alimony and child custody laws. Florida is lagging behind many states which have updated these laws to reflect the fact that most women now work outside of the home and that children need both parents to thrive, regardless of whether their parents are living together or apart. 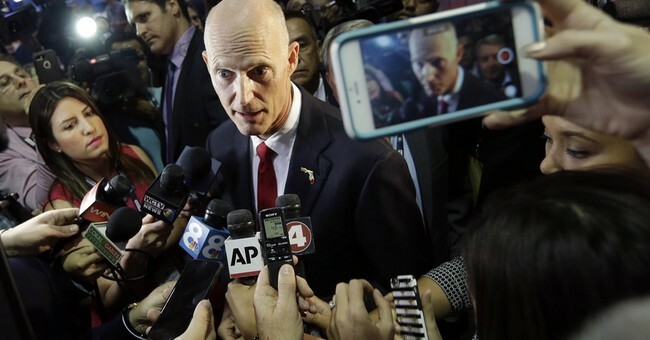 Sadly, Florida Governor Rick Scott (R) capitulated to intense lobbying by liberal special interest groups and vetoed the bill. The bill had immense support, passing both houses of the Florida legislature by super-majority margins. The governor’s office said they had received 13,000 calls about the bill, with a 5-to-1 ratio favoring it. Advocates even flooded the office carrying signs last week. The lobbying against the bill was led by the Family Law Section of the Florida Bar Association and radical feminist groups such as the National Organization for Women. The Family Law Section spent $105,000 to hire "emergency lobbyists" for two weeks of intense lobbying. The lobbyists included some who used to work for the governor. A concerned citizen submitted a public records request to the Florida Bar, which requested information about the lobbying. The Bar responded to the request with 100 pages of documents. Tellingly, there was not a single mention about the effect the legislation would have on children. They never discussed it or considered it. They ignored the fact that shared parenting is best for children in most cases, has the endorsement of 110 world experts, and is favored by 70 percent of the population. Perhaps even more disturbing, there was input from sitting judges and magistrates “as to the negative impact this bill will have." This judicial lobbying violates the constitutional separation of powers and the canons of judicial ethics. Judges have already been rebuked in Nebraska for lobbying against shared parenting bills they could be called upon to interpret later. The Family Law Section of the Florida Bar thinks they can get away with this unseemly activity because many people are afraid of the Bar. Attorneys who speak up risk being targeted by the Bar under bogus pretenses, which could mean losing their licenses, reputations and finances. Regular citizens who try to take on the Bar often get nowhere because of its deep pockets; who can afford to take on lawyer union bosses swimming in cash from the exorbitant mandatory dues charged attorneys? Here’s the root of the problem: more than half of the state Bars in the country, including Florida’s, get easy money because attorneys are required to join them as a condition of being able to practice law. In this respect, they are like mandatory unions. Incredibly, this is true even in staunch right-to-work states like Arizona and North Dakota. In theory, there are strict rules that limit how mandatory Bar associations can spend dues for political purposes. In practice, however, many mandatory Bar associations simply ignore the rules. Last year, the North Dakota state bar settled a lawsuit against it for not complying with any of the rules that regulate the use of mandatory bar dues for political purposes. A year earlier, the Nebraska State Bar Association was effectively de-integrated by the Nebraska Supreme Court because of its misuse of mandatory bar dues. In both cases, the issue that triggered the lawsuits was bar lobbying against shared parenting bills. A bill is currently pending in Arizona that would take steps to making membership in the Arizona bar voluntary. There is widespread public belief that the political process is a rigged, insider’s game that no longer represents the public interest. Recent events in Florida certainly provide support for this belief. How else can you explain a governor, who was elected as a conservative outsider, capitulating to lobbying by liberal special interests and vetoing a bill that passed by houses of the Florida legislature by overwhelming margins?